Genuine artistry and prettiness are the main features of Fair Trade Egypt’s first collection. Ancient Egyptian signature colours and ornaments are cleverly scattered around the place. Akhmim’s excellent textiles in a wine colour pallet, Siwa clever stitches on soft sandy coloured linen opens a whole new world of possibilities. In their new premises in Maadi, Fair Trade Egypt (FTE) has been busy collecting Egyptian traditional gems into one theme: The shades of Ra. This first themed collection was their reaction to the economic situation of artisans, which has deteriorated due to the political and economic unrest of the past three years. Hence they came up with the concept of re-introducing handicraft ornaments with a new edge. “First we did a mood board for all folk heritage sources we have in Egypt, then we depicted the ancient Egyptian colour pallet because it is the beginning of the story,” explained Mona Sorour, product development officer at FTE. “Ancient Egyptian artists excelled in using Alabaster stone in goblets and boxes. Here we have lots of alabaster artwork that is inspired by them,” added Sorour as she exhibited a mélange of alabaster coasters, cutting boards and boxes with copper and wooden ornaments. FTE went a step further when they re-introduced signature copper mirrors of ancient Egypt with engravings of Lotus flowers and Hathour (Goddess of Beauty). “The technique of sawing, welding and hammering copper is quite a challenge. But we trained them and the results were excellent," she added. Toying with traditional sewing techniques and blending them with different fabrics and colours rejuvenated the authentic concept all together. It allowed Siwa clever stitches to break away from traditional orange and red colours and delve into the soft sandy colour of ancient Egyptian linen and soft fabrics. Handmade glass with a touch of ancient Egyptian blue, bed covers, cushions and cloths that shimmer with silver Talli stitches. All in a variation of soft earth colors that blend with vivid blue and grass green. Fair Trade, internationally speaking, started off in the 1980s to empower artisans by encouraging them to produce handicraft and selling it for them, while also giving them a fair share of the sales. It contributes to sustainable development by offering better trading conditions to and securing the rights of marginalised producers and workers. “FTE started off in 2004," explained Hayam Mansour, product development officer, adding that they built upon their former experience with indigenous artists and the market for they were known for years as Egypt Craft Center. Touching the lives of over 2,600 artisans, FTE has managed to boost the handicraft market. 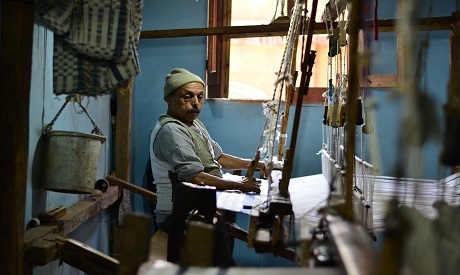 Anwar Ayad, 60, has been a weaver for as long as he can remember. Born and raised in Akhmim Sohag, textiles run in his family. FTE provides health care services, awareness classes, principles of fair trade as well as literacy classes to the artists they work with. “We not only develop a product, we develop producers," concluded Mansour.